Background: Cancer has been recognized as a major cause of death globally. Traditional medicines have been used to treat cancer for several periods, and herbal medicines are currently being used for the treatment of cancer worldwide. Fenugreek is an annual plant (family: Fabaceae) and is documented as a medicinal herb since olden days. Objective: The present study was aimed to investigate the anticancer activity of Fenugreek seed oil (FSO) against human hepatocellular carcinoma (HepG2) cell line. Materials and Methods: The HepG2 cells were exposed to 10–1000 μg/ml of FSO for 24 h to assess the cytotoxicity using 3-(4,5-dimethylthiazol-2-yl)-2,5-diphenyl tetrazolium bromide test, neutral red uptake assay, and morphological changes. The cytotoxic concentrations of FSO were used to study the induction in reactive oxygen species (ROS) and mitochondrial membrane potential (MMP) levels. Further, the expression of pro-and antiapoptotic genes (p53, caspase-3, caspase-9, Bax and Bcl-2) were studied. Results: A concentration-dependent decrease in cell viability of HepG2 cells was observed after FSO exposure. Our results showed that FSO decreased cell viability of HepG2 cells in a concentration-dependent manner. FSO was also found to increase the ROS generation and decrease the MMP level in HepG2 cells. Our gene expression study indicates upregulation in apoptotic marker genes and downregulation in antiapoptotic gene. Conclusion: The results showed that FSO is capable to induce mitochondrial-mediated apoptosis through ROS generation in HepG2 cells and could be a useful resource in developing effective remedies for the treatment of hepatocellular carcinoma. Abbreviations used: FSO: Fenugreek seed oil; HepG2: Human hepatocellular carcinoma; ROS: Reactive oxygen species; NRU: Neutral red uptake; DMSO: Dimethyl sulfoxide; MTT: 3-(4,5-dimethylthiazol-2-yl)-2,5-diphenyl tetrazolium bromide; MMP: Mitochondrial membrane potential; DNA: Deoxyribonucleic acid; RNA: Ribonucleic acid; DCFH-DA: 2,7-dichlorofluorescein diacetate; FBS: Fetal bovine serum; PBS: Phosphate-buffered saline; PCRq: quantitative real-time PCR; NaHCO3: Sodium bicarbonate; CO2: Carbon dioxide; DMEM: Dulbecco's modified eagle medium. Fenugreek seed oil (FSO) decreased the cell viability of human hepatocellular carcinoma (HepG2) cells in a concentration-dependent manner. FSO was also found to increase the reactive oxygen species (ROS) generation and decrease the mitochondrial membrane potential level in HepG2 cells. The gene expression studies indicated upregulation in the apoptotic marker genes (p53, Bax, caspase-9, and caspase-3) and downregulation in Bcl-2 gene. The results from the present study showed that FSO is capable to induce mitochondrial-mediated apoptosis through ROS generation in HepG2. Cancer has been recognized as a cause of death worldwide, and number of cases of occurrence of cancer is increasing regularly. More than 80% of the hepatocellular carcinoma cases arise in the Asian Pacific regions and Saharan Africa. and more than 50% cases account in China alone. Hepatocellular carcinoma is utmost cause of death in men globally due to the poor diagnosis. There are various types of the formulations available to treat the different kind of cancer diseases, however, none of them is found to be effective and safe., The drawback with chemotherapy as a cancer treatment is the toxicity of the established drugs. The traditional therapeutic drugs used are frequently linked with harmful effects. However, herbal or plant-derived natural products are known to be benign and effective for the management of cancer diseases. Nowadays, maximum research are targeted toward the use of plants or natural products derived anticancer agents from plants. Therefore, searching for new natural products and their analogs for the management of hepatocellular carcinoma is the need of the day. Many studies demonstrated that natural products could be useful for the anticancer drug development., Fenugreek, an annual plant of Fabaceae family, is being cultivated worldwide as a semiarid crop and its leaves and seeds are common ingredients in dishes from South Asia. Fenugreek is being used as a culinary and medicinal herb since ancient. The Fenugreek has a strong flavor and aroma. It is used as a spice in the preparation of a variety of dishes, and pickles. The Fenugreek seeds are found to possess restorative and nutritive properties and are helpful in stimulating digestive processes. The seeds of Fenugreek are used for the treatment of diabetes and hyper cholesterol anemia. Many studies have shown the efficacy of Fenugreek seeds that can benefit health and treat diseases. Fenugreek is very well documented for anti-oxidative, anti-inflammatory, antilipidemic, anticancer, antiulcerogenic, antipyretic, antibacterial, and antifungal activities. The experimental evidences prove the efficacy of Fenugreek in diabetic patients. Numerous studies also demonstrated the hepatoprotective potential of Fenugreek seeds in various experiments., In previous research, Fenugreek seeds have been found to be protective against breast and colon cancers. Many active ingredients isolated from Fenugreek seeds and their beneficial effects have previously been reported. These studies clearly indicate that Fenugreek seeds could be beneficial against cancer cells. However, details on molecular mechanism(s) involved in hepatic cancer cell death are not fully studied. Therefore, this in vitro study, we aimed to explore the possible anticancer efficacy of Fenugreek seeds against human hepatocarcinoma (HepG2) cell line. The HepG2 cells are known to be a good model system for studying the protective effect against liver diseases. 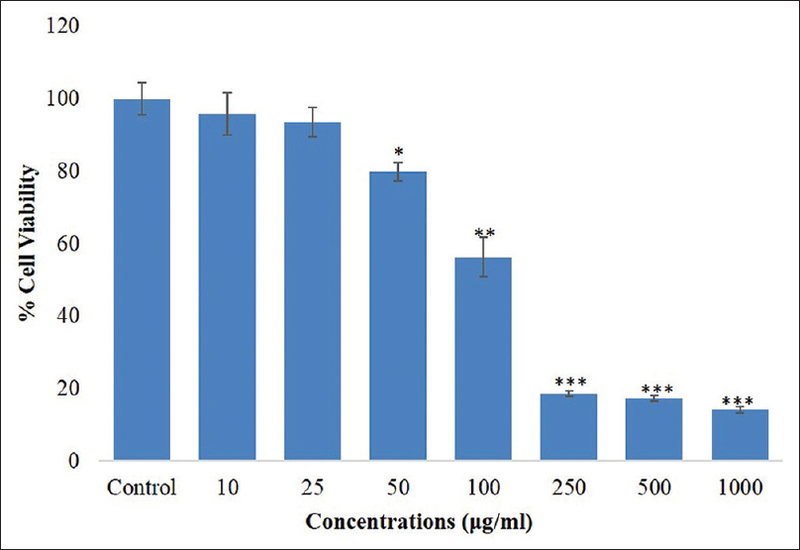 HepG2 cells were grown in Dulbecco's modified Eagle medium (DMEM) high glucose medium with 10% fetal bovine serum (FBS), 0.2% NaHCO3, and antibiotic solution in a carbon dioxide (CO2) incubator at atmosphere of 5% CO2 and 95% humidity. DMEM culture medium, solvents, dyes, and chemicals were purchased from Sigma and FBS, antibiotic–atimycotic and trypsin from Invitrogen. Fenugreek seeds used in the present investigation were purchased from local market of Riyadh, KSA and were identified by plant taxonomist Dr. Jakob Thomas, College of Science, King Saud University. The seeds were screened, grounded, and stored for extraction. The oil was extracted following the protocol of Horwitz. Due to the nonsolubility of Fenugreek seed oil (FSO) in aqueous medium, the stock solution was dissolved in dimethyl sulfoxide (DMSO). The maximum DMSO concentration was 0.1% in medium. The cytotoxic potential was determined by 3-(4,5-dimethylthiazol-2-yl)-2,5-diphenyl tetrazolium bromide (MTT) test, neutral red uptake assay (NRU), and morphological alterations in HepG2 cells after exposing with 10, 25, 50, 100, 250, 500, and 1000 μg/ml of FSO for 24 h. Then, cytotoxic concentrations, i.e. 50, 100, and 250 μg/ml of FSO were used for analysis of induction in ROS and mitochondrial membrane potential (MMP) levels. Further, HepG2 cells were exposed to 50 and 100 μg/ml for the ribonucleic acid (mRNA) expression of apoptotic marker genes. Following the protocol of Mosmann, MTT test was performed to determine the percent cell viability. Briefly, the HepG2 cells (1 × 104) were seeded and left overnight for adherence. After the respective treatment, 10 μl/well (5 mg/ml of MTT) was added and subjected to incubation for 4 h. Then, supernatant was discarded and formazone crystals were solubilized in 200 μl of DMSO. The absorbance of plate was then measured at 550 nm. NRU assay was done using method described previously. Briefly, HepG2 cells (1 × 104) were plated and left overnight for adherence. After treatment, cells were rinsed with phosphate buffer saline and incubated in 50 μg/ml neutral red dye for 3 h. Then, the cells were washed and dye was extracted in acetic acid solution. The developed color was measured at 550 nm. Morphological changes in HepG2 cells were observed under the microscope. 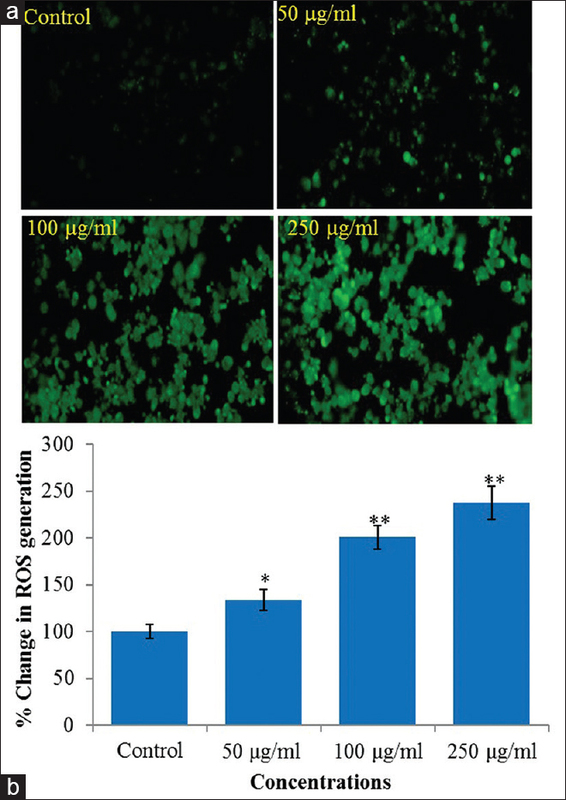 HepG2 cells were treated with 10, 25, 50, 100, 250, 500, and 1000 μg/ml concentrations of FSO for 24 h.
Following the protocol of Wang and Joseph, the ROS generation was measured using 2,7-dichlorofluorescein diacetate (DCFH-DA) dye with desired modifications. In brief, cells were treated for 24 h at 50–250 μg/ml FSO. After the treatment, cells were rinsed and exposed with DCFH-DA (20 μM) for 1 h in dark. The fluorescence was measured using spectrofluorometer. The cells were also examined to see the intracellular fluorescence intensity under the fluorescence microscope. The MMP level in HepG2 cells exposed to FSO was measured according to protocol of Zhang et al. Briefly, after exposure to 50–250 μg/ml of FSO for 24 h, cells were exposed to Rh123 dye (10 μg/ml) in dark for 1 h. The fluorescence was measured using spectrofluorometer and images were taken at 20× magnification. The RNA was isolated using the RNeasy kit from the HepG2 cells treated with 50 and 100 μg/ml FSO for 24 h. After cDNA synthesis using M-MLV (Promega) and oligo (dT) primers (Promega), the expression level of pro- and anti-apoptotic marker genes were quantified by real-time polymerase chain reaction using Light Cycler® 480 instrument (Roche Diagnostics, Rotcreuz, Switzerland) following the protocol. The primer sequences used are detailed in our previous publication. Post hoc Dunnett's test (ANOVA) was used for statistical analysis. [Figure 1] represents the results of percent cell viability by MTT assay in HepG2 cells. The results showed that FSO exhibited a concentration-dependent decrease in the viability of HepG2 cells after 24 h exposure. The percent viability was recorded as 79%, 56%, 18%, 17% and 14% at 50, 100, 250, 500, and 1000 μg/ml concentrations of FSO, respectively. The IC50 values of FSO obtained by MTT assay was 113.6 μg/ml [Figure 1]. The percent cell viability obtained by NRU assays are presented in [Figure 2]. As shown in figure, a concentration-dependent decreased in the percent cell viability was recorded in HepG2 cells exposed to FSO for 24 h. The percent cell viability in HepG2 cells was observed as 69%, 45%, 20%, 18%, and 15% at 50, 100, 250, 500, and 1000 μg/ml concentrations, respectively. The IC50 values of FSO obtained by NRU assay was 90.9 μg/ml [Figure 2]. Morphological alterations of treated HepG2 are presented in [Figure 3]. Morphological changes in HepG2 cells were recorded under the microscope. The results showed that cells exposed to 50 μg/ml FSO and beyond become rounded, shrinked, less adherent than control, and lost their original morphology and shape. However, HepG2 cells exposed to 10 and 25 μg/ml of FSO did not show any change in the original morphology. The results of FSO-induced ROS generation are shown in [Figure 4]. The induction in ROS generation in HepG2 cells exposed for 24 h was observed at 50, 100 and 250 μg/ml FSO concentrations. The increase in ROS was examined as 134% ± 11%, 201% ± 12.40%, and 238% ± 17.8% at 50, 100 and 250 μg/ml concentrations of FSO, respectively [Figure 4]. FSO induced changes in the level of MMP are summarized in [Figure 5]. For the measurement of MMP, cells were exposed for 24 h at 50–250 μg/ml of FSO. The results showed a dose-dependent decrease in the level of MMP after FSO exposure. The decrease observed in the level of MMP was as 82% ± 5.4%, 58% ± 4.2% and 41% ± 3.1% at 50, 100 and 250 μg/ml FSO concentrations, respectively [Figure 5]. Result highlights of FSO induced mRNA expression of apoptosis marker genes are presented in [Figure 6]. A significant (P < 0.05) upregulation of 1.96 and 2.09 fold in the expression of pro-apoptotic gene p53, 2.1 and 2.5 fold in caspase-3, 1.8 and 1.87 in caspase-9, and 1.85 and 1.93 in Bax was found at 50 and 100 μg/ml concentration of FSO, respectively. 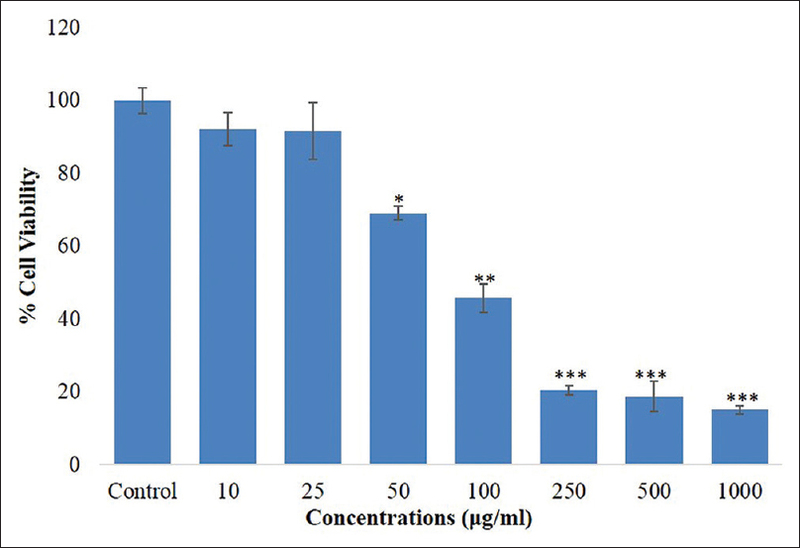 The downregulation of 0.7 and 0.65 fold in anti-apoptotic gene Bcl-2 was found at 50 and 100 μg/ml of FSO concentrations, respectively [Figure 6]. Traditional therapeutic drugs used are frequently linked with harmful effects and triggered damage to healthy cells. Although many researches have been carried out for progressions in the management and regulation of cancer, significant effort and possibility for its enhancement remains. Natural therapies, such as plants or plant-derived natural products, have been used for health benefits and are beneficial to combat cancer. A number of studies have shown that the efficacy of Fenugreek seeds that can benefit human health. There have been numerous research studies conducted on qualitative and quantitative analysis of Fenugreek seeds and oils.,, Therefore, in this study, we targeted to study the anticancer effect of FSO against HepG2 cells. The cytotoxicity of the seed oil was determined by MTT and NRU assays. These colorimetric assays are frequently used parameters for cytotoxicity measurements. Since, MTT assay and NRU assess different cellular functions;, therefore, we implied both assays to observe the possible cytotoxicity of FSO. From both assays, MTT and NRU showed a concentration-dependent decrease in the percent cell viability of HepG2 cells exposed to FSO for 24 h. Our cytotoxicity data are in agreement with the published reports that showed cytotoxic potential of Fenugreek seed extract against cancer cell lines, T-cell lymphoma in vitro. In another study, alcoholic extracts of Fenugreek exhibited cytotoxic response in vitro against various human cancer cell lines such as, neuroblastoma (IMR-32) and colon adenocarcinoma cell line (HT29). The anticancer potential of seed oil of Fenugreek against human breast adenocarcinoma cells and human epidermoid cancer cells have also shown that Fenugreek seeds oil significantly decreased cell viability and altered the morphology in a concentration-dependent manner. We also evaluated that the effect of cytotoxic concentrations of FSO on ROS generation, MMP level and the expression of apoptosis genes in human liver cancer (HepG2) cells. Studies showed that the exposure of plants or plant-derived products promotes oxidative stress. In this study, we have shown a concentration-dependent induction in ROS. It is well known that an induction in ROS is one of the common causes of apoptotic cell death., Our results are coherent with the earlier reports where an induction in ROS has been shown after the treatment with natural products. It is also observed that cell death can occur by mitochondrial damage with increase in ROS generation. 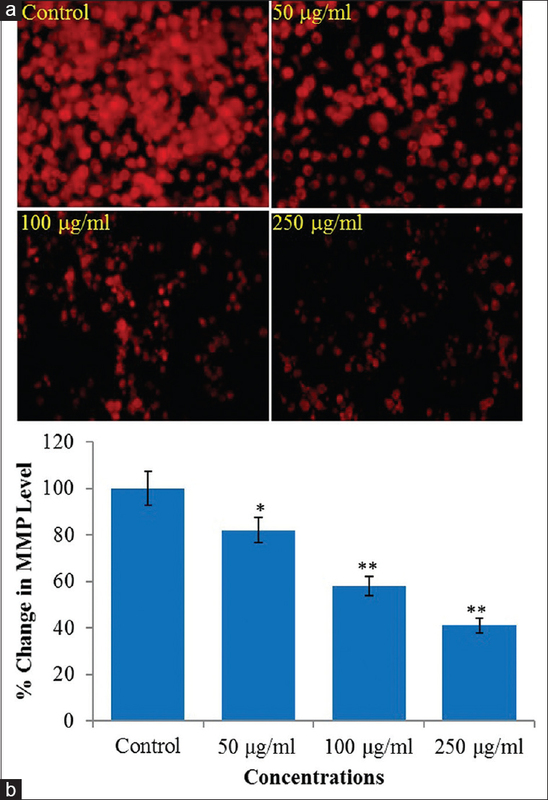 In this study, a dose-dependent decrease in the MMP level in HepG2 cells showed that the exposure of FSO could damage the mitochondrial membrane. This decrease in MMP level clearly indicates the role of ROS generation in cell death of HepG2 cells. The mitochondrial-mediated pathways associated with anticancer drugs, utilize caspase-9, cytochrome c and protease activating factor 1. Bcl-2 proteins; (pro-apoptotic- Bax, Bad and Bak) and anti-apoptotic proteins (Bcl-2, BclxL, and Bcl-w) are known to regulate the mitochondrial apoptotic pathways. The p53 gene plays an important role in apoptosis and is the most frequent genetic change in human cancer. Reports suggest p53 induces apoptosis through transcription-dependent and independent mechanisms. Many of the pro-apoptotic Bcl-2 family genes, for example, Bax, are known targets of p53. The mitochondrial disruption through Bax activation and Bcl-2 inhibition and the release of cytochrome-c into the cytosol, activate caspase 9 that triggers caspase-3 activation. In this investigation, we have evaluated the expression of several mitochondria-related apoptotic genes at transcriptional level. Our results showed upregulation in the expression of pro-apoptotic genes (p53, Bax, caspase-3 and caspase-9) and downregulation in anti-apoptosis gene, Bcl-2. These results demonstrated that FSO-induced apoptosis in HepG2 cells involving mitochondria-mediated pathway. Therefore, results from this study suggested that the role of mitochondrial pathway in FSO induced apoptosis in HepG2 cells. Other natural products have also observed these kinds of cancer cell growth inhibitory and apoptotic activities in HepG2 cells through mitochondrial-mediated pathways. Our results demonstrated that FSO exerts apoptosis in HepG2 cells. The FSO was found to exhibit cytotoxicity in a concentration-dependent manner in HepG2 cells and induced apoptosis via mitochondrial pathway in hepatocellular carcinoma cells. The apoptosis induction was found to be associated with ROS generation and MMP. 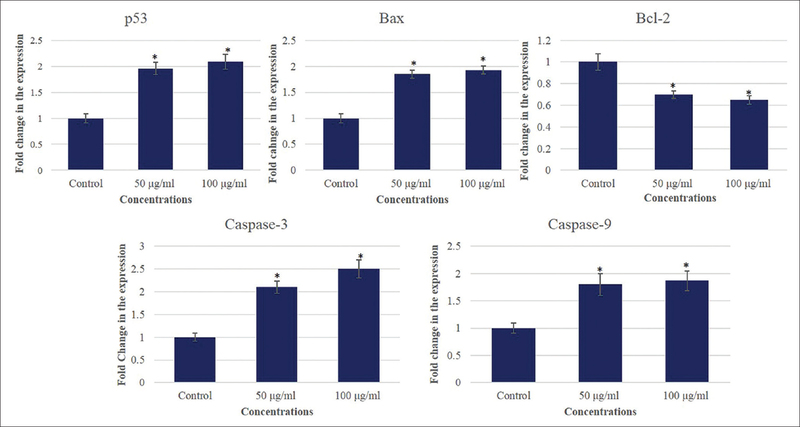 The gene expression study indicates upregulation in apoptotic marker genes (p53, caspase-3, caspase-9, and Bax) and downregulation in Bcl-2 gene. These results suggested that FSO is capable of inducing mitochondrial-mediated apoptosis in HepG2 cells through ROS generation cells and could be a useful resource to develop an effective remedy for hepatocellular carcinoma. Fazeli Z, Pourhoseingholi MA, Vahedi M, Zali MR. Burden of hepatocellular carcinoma in Asia. Asian Pac J Cancer Prev 2012;13:5955-8. Sanyal AJ, Yoon SK, Lencioni R. The etiology of hepatocellular carcinoma and consequences for treatment. Oncologist 2010;15 Suppl 4:14-22. El-Serag HB, Rudolph KL. Hepatocellular carcinoma: Epidemiology and molecular carcinogenesis. Gastroenterology 2007;132:2557-76. Samarakoon SR, Shanmuganathan C, Ediriweera MK, Piyathilaka P, Tennekoon KH, Thabrew I, et al. Anti-hepatocarcinogenic and anti-oxidant effects of mangrove plant Scyphiphora hydrophyllacea. Pharmacogn Mag 2017;13:S76-S83. Prakash OM, Kumar A, Kumar P. Anticancer potential of plants and natural products: A review. Am J Pharmacol Sci 2013;1:104-15. Saini RK, Chouhan R, Bagri LP, Bajpai AK. Strategies of targeting tumors and cancers. J Cancer Res 2012;1:129-52. Ekor M. The growing use of herbal medicines: Issues relating to adverse reactions and challenges in monitoring safety. Front Pharmacol 2014;4:177. Al-Oqail MM, Al-Sheddi ES, Siddiqui MA, Musarrat J, Al-Khedhairy AA, Farshori NN, et al. Anticancer activity of chloroform extract and sub-fractions of Nepeta deflersiana on human breast and lung cancer cells: An in vitro cytotoxicity assessment. Pharmacogn Mag 2015;11:S598-605. Farshori NN, Al-Sheddi ES, Al-Oqail MM, Musarrat J, Al-Khedhairy AA, Siddiqui MA, et al. Anticancer activity of Petroselinum sativum seed extracts on MCF-7 human breast cancer cells. Asian Pac J Cancer Prev 2013;14:5719-23. Al-Oqail M, Al-Sheddi ES, Al-Massarani SM, Siddiqui MA, Ahmad J, Musarrat J, et al. Nigella sativa seed oil suppresses cell proliferation and induces ROS dependent mitochondrial apoptosis through p53 pathway in hepatocellular carcinoma cells. South Afr J Bot 2017;112:70-8. Kaviarasan S, Ramamurty N, Gunasekaran P, Varalakshmi E, Anuradha CV. Fenugreek (Trigonella foenum graecum) seed extract prevents ethanol-induced toxicity and apoptosis in Chang liver cells. Alcohol Alcohol 2006;41:267-73. Van Alfen NK. Encyclopedia of Agriculture and Food Systems. Davis, CA, USA: Elsevier; 2014. Patel DK, Dhanabal SP. Development and optimization of bioanalytical parameters for the standardization of Trigonella foenum-graecum. J Acute Dis 2013;2:137-9. Lu KH, Liu CT, Raghu R, Sheen LY. Therapeutic potential of Chinese herbal medicines in alcoholic liver disease. J Tradit Complement Med 2012;2:115-22. Yadav UC, Baquer NZ. Pharmacological effects of Trigonella foenum-graecum L. in health and disease. Pharm Biol 2014;52:243-54. Verma N, Usman K, Patel N, Jain A, Dhakre S, Swaroop A, et al. Amulticenter clinical study to determine the efficacy of a novel Fenugreek seed (Trigonella foenum-graecum) extract (Fenfuro™) in patients with type 2 diabetes. Food Nutr Res 2016;60:32382. Thirunavukkarasu V, Anuradha CV, Viswanathan P. Protective effect of Fenugreek (Trigonella foenum graecum) seeds in experimental ethanol toxicity. Phytother Res 2003;17:737-43. Kaviarasan S, Anuradha CV. Fenugreek (Trigonella foenum graecum) seed polyphenols protect liver from alcohol toxicity: A role on hepatic detoxification system and apoptosis. Pharmazie 2007;62:299-304. Amin A, Alkaabi A, Al-Falasi S, Daoud SA. Chemopreventive activities of Trigonella foenum graecum (Fenugreek) against breast cancer. Cell Biol Int 2005;29:687-94. Raju J, Patlolla JM, Swamy MV, Rao CV. Diosgenin, a steroid saponin of Trigonella foenum graecum (Fenugreek), inhibits azoxymethane-induced aberrant crypt foci formation in F344 rats and induces apoptosis in HT-29 human colon cancer cells. Cancer Epidemiol Biomarkers Prev 2004;13:1392-8. Liu Y, Kakani R, Nair MG. Compounds in functional food Fenugreek spice exhibit anti-inflammatory and antioxidant activities. Food Chem 2012;131:1187-92. Abreu RM, Ferreira IC, Calhelha RC, Lima RT, Vasconcelos MH, Adega F, et al. 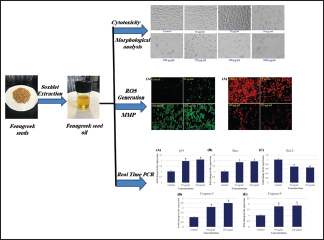 Anti-hepatocellular carcinoma activity using human hepG2 cells and hepatotoxicity of 6-substituted methyl 3-aminothieno[3,2-b] pyridine-2-carboxylate derivatives:In vitro evaluation, cell cycle analysis and QSAR studies. Eur J Med Chem 2011;46:5800-6. Horwitz W. AOCS: Official Methods of Analysis of the Association of Official Analytical Chemist. 13th ed., Vol. 7. Washington DC, USA: 1980. p. 56-132. Borenfreund E, Puerner JA. Short-term quantitative in vitro cytotoxicity assay involving an S-9 activating system. Cancer Lett 1987;34:243-8. Wang H, Joseph JA. Quantifying cellular oxidative stress by dichlorofluorescein assay using microplate reader. Free Radic Biol Med 1999;27:612-6. Zhang Y, Jiang L, Jiang L, Geng C, Li L, Shao J, et al. Possible involvement of oxidative stress in potassium bromate-induced genotoxicity in human hepG2 cells. Chem Biol Interact 2011;189:186-91. Kashyap MP, Singh AK, Siddiqui MA, Kumar V, Tripathi VK, Khanna VK, et al. Caspase cascade regulated mitochondria mediated apoptosis in monocrotophos exposed PC12 cells. Chem Res Toxicol 2010;23:1663-72. Al-Sebaeai MA, Alfawaz M, Chauhan AK, AL-Farga A, Fatma S. Physicochemical characteristics and nutritional value of Fenugreek seeds and seed oil. Int J Food Sci Nutr 2017;2:52-5. Dilshad A. Physicochemical properties of chemurgic-Fenugreek (Trigonella foenum-graecum) herb of different origin. Der Pharma Chem 2017;9:102-6. Aljuhaimi F, Şimşek Ş, Özcan MM, Ghafoor K, Babiker EE. Effect of location on chemical properties, amino acid and fatty acid compositions of fenugreek (Trigonella foenum-graecum L.) seed and oils. J Food Process Preserv 2018;42:e13569. Alsemari A, Alkhodairy F, Aldakan A, Al-Mohanna M, Bahoush E, Shinwari Z, et al. The selective cytotoxic anti-cancer properties and proteomic analysis of Trigonella foenum-graecum. BMC Complement Altern Med 2014;14:114. Verma SK, Singh SK, Mathur A.In vitro cytotoxicity of Calotropis procera and Trigonella foenum-graecum against human cancer cell lines. J Chem Pharm Res 2010;2:861-5. Al-Oqail MM, Farshori NN, Al-Sheddi ES, Musarrat J, Al-Khedhairy AA, Siddiqui MA, et al. In vitro cytotoxic activity of seed oil of Fenugreek against various cancer cell lines. Asian Pac J Cancer Prev 2013;14:1829-32. Abdullah AS, Mohammed AS, Rasedee A, Mirghani ME. Oxidative stress-mediated apoptosis induced by ethanolic mango seed extract in cultured estrogen receptor positive breast cancer MCF-7 cells. Int J Mol Sci 2015;16:3528-36. Cross CE, Halliwell B, Borish ET, Pryor WA, Ames BN, Saul RL, et al. Oxygen radicals and human disease. Ann Intern Med 1987;107:526-45. Liou GY, Storz P. Reactive oxygen species in cancer. Free Radic Res 2010;44:479-96. Ghali W, Vaudry D, Jouenne T, Marzouki MN. Extracts from medicinal plants inhibit cancer cell proliferation, induce apoptosis in ovary, lung and neuronal cancer cell lines. Cancer Metabol 2014;2:1-2. Siddiqui MA, Saquib Q, Ahamed M, Farshori NN, Ahmad J, Wahab R, et al. Molybdenum nanoparticles-induced cytotoxicity, oxidative stress, G2/M arrest, and DNA damage in mouse skin fibroblast cells (L929). Colloids Surf B Biointerfaces 2015;125:73-81. Goh BH, Chan CK, Kamarudin MN, Abdul Kadir H. Swietenia macrophylla king induces mitochondrial-mediated apoptosis through p53 upregulation in HCT116 colorectal carcinoma cells. J Ethnopharmacol 2014;153:375-85. Hakem R, Hakem A, Duncan GS, Henderson JT, Woo M, Soengas MS, et al. Differential requirement for caspase 9 in apoptotic pathways in vivo. Cell 1998;94:339-52. Heath-Engel HM, Shore GC. Mitochondrial membrane dynamics, cristae remodelling and apoptosis. Biochim Biophys Acta 2006;1763:549-60. Moll UM, Wolff S, Speidel D, Deppert W. Transcription-independent pro-apoptotic functions of p53. Curr Opin Cell Biol 2005;17:631-6. Yamaguchi H, Chen J, Bhalla K, Wang HG. Regulation of Bax activation and apoptotic response to microtubule-damaging agents by p53 transcription-dependent and -independent pathways. J Biol Chem 2004;279:39431-7. Yu J, Zhang L, Hwang PM, Kinzler KW, Vogelstein B. PUMA induces the rapid apoptosis of colorectal cancer cells. Mol Cell 2001;7:673-82. Cain K, Brown DG, Langlais C, Cohen GM. Caspase activation involves the formation of the aposome, a large (approximately 700 KDa) caspase-activating complex. J Biol Chem 1999;274:22686-92.